Trying to find something good on TV last night – ended up watching “Ghost” for the sixth time - I caught a few minutes of this movie, which got me thinking of how underestimated Jeff Bridges is. I find him a fine, talented and versatile actor but don’t think he has received the deserved attention/acclamation. He also lets the other actors he works with shine. 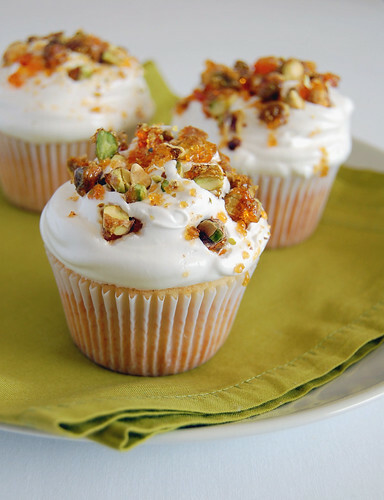 My vanilla cupcakes do the same here: they are delicious – made with real vanilla – but are humble enough to let the frosting and pistachio praline shine. Preheat the oven to 180ºC/350ºC. Place the butter, sugar and vanilla in the bowl of an electric mixer and beat until light and creamy. Gradually add the eggs and beat well. Sift over the flour and baking powder and beat until combined. Add the milk and mix. Spoon the mixture into eleven 1/3-cup capacity muffin pans lined with paper cases. Bake for 15-17 minutes or until cooked through when tested with a skewer. Remove from the pans and cool on a wire rack. Make the praline: line a baking sheet with a piece of foil, butter it and place the pistachio nuts on top. Set aside. Place the sugar and water in a saucepan over low heat and stir until sugar is dissolved. Increase the heat and bring to the boil, brushing the sugar crystals from the inside of the saucepan with a wet pastry brush. Cook for 8-10 minutes or until dark golden. Remove from the heat and pour toffee over the nuts. Allow to cool completely. Break up the pistachio praline into large pieces and then chop them with a knife to small bits. Set aside. To make the whipped icing, place the sugar, water and cream of tartar in a small saucepan over high heat and stir until sugar is dissolved. Bring to the boil, reduce the heat to medium and simmer for 3 minutes. Meanwhile, place the egg whites and salt in the bowl of an electric mixer and beat until soft peaks form. While the motor is still running, gradually add the sugar mixture and beat until thick and glossy. 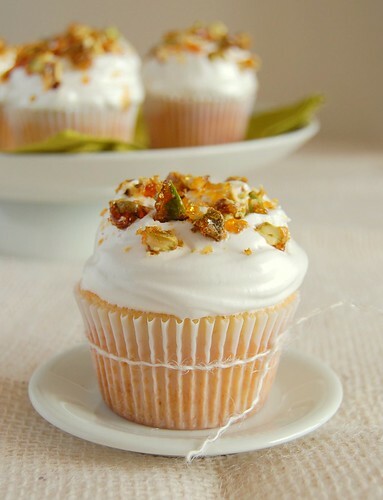 Spread the icing over the cupcakes with a palette knife and top with the pistachio praline. Don't you love vanilla anything? I hate to sound bland- but frankly I have never thought of vanilla that way. Your praline topping is just the right touch. And your photographs are beautiful. oh these look spectacular!! I love the praline topping which look like jewels. I just want to nibble at the topping, is that okay? This pistachio praline is beautiful!!! So unique!! YUM! Beautiful photos! Beautiful photos - and I bet that praline adds the perfect crunch to those cupcakes. Delicious! That whipped icing looks tempting! I agree with Jeff Bridges, but I think the problem is his voice! gorgeous and scrumptious looking cupcakes patricia. love the topping on this! Lovely. I really think I might try these. They won't be as pretty or as tasty as yours I'm sure. But I am so tempted. Barbara, I do! Especially after I came to know real vanilla. Addictive! Bron, you are far too kind, darling! Thereddeer, tks for stopping by! Eve, thank you for visiting! Pam, I'm sure yours will be wonderful. These look really delightful. This is one cupcake topping I haven't seen before - always great to find something new! I came across your blog as I was looking around. You have some pretty neat stuffs that I would surely love to try some of them. Beautiful Pat, just so elegant & beautiful. And of course i love that the topping is white & not buttah! Love the pistachio praline too. Gosh! It's so hard to find unsalted pistachios here but I am gonna hunt them down as I MUST make this. Fantastic recipe and yummy pics. What is the texture like of these cupcakes?